The small, overcrowded, low-lying Netherlands might not sound like the answer to feeding a world whose population is predicted to rise to 9.6 billion people by 2050, but farmers and agronomists there would beg to differ. The country known best globally for its traditional tulips and wooden footwear, is the second largest vegetable exporter in the world—with exports totaling €6 billion annually. Onions, potatoes and some southern climate vegetables such as tomatoes, peppers and chiles are among its top selling products. The Netherlands is growing them with far less water and pesticides than if production was happening in the soil or open air. They do it using greenhouse technology, termed ‘precision farming,’ that some in the Dutch food industry claim is the most advanced in the world. In the vast high-tech greenhouses of sustainable producers Duijvestijn Tomatoes, vines drip with red, yellow, green and dark purple fruit. In these highly controlled spaces, visitors are required to wear hygiene overalls. “In the end, the plant is around 13 to 14 meters (42.7 feet to 45.9 feet) long and will produce about 33 clusters of tomatoes,” Ad van Adrichem, general manager at Duijvestijn Tomatoes told DW. Reaching such heights is important in a country where land is as precious as it is scarce: the tiny Netherlands has one of the highest population densities in the world. In the greenhouses of Westland, an area that was reclaimed at great cost and effort from the sea, they grow almost 70 kilograms (154 pounds) of tomatoes per square meter. That’s at least 10 times the average yield from an open field in Spain or Morocco, but with eight times less water and practically no chemical pesticides. But that’s not all that’s at play. There are also the greenhouses themselves. Duijvestijn Tomatoes has invested in a revolutionary double-glass roof which conserves more heat and, thanks to special coatings, diffuses the light that gets through, thereby making sure it also reaches the plants’ lower leaves. The water used is all pure Dutch rain, captured and stored in an underground layer of sand for use through the dry months. Whenever pests appear, they bring in insects to eat them. Herman van Bekkem, campaign leader for Greenpeace Holland, says water managers in Westland have been complaining about the high amounts of pesticides in surface water for many years. This seems virtually unbelievable; the Netherlands, a country roughly 41,500 square kilometers, is small when compared to West Virginia (62,756 sq. km). Yet the Netherlands is the second largest vegetable exporter in the world. There is seemingly no end to the inventiveness of man. The product is just amazing. This writer was recently in Europe, admiring vegetables of immensely superior quality than in South Carolina. That puts a damper on those who a few decades ago warned that the world will run out of food. Actually, another report stated that almost one-third of all food produced, including meat, is discarded—outright wasted. That’s another amazing achievement of modern technology under the umbrella of globalism. 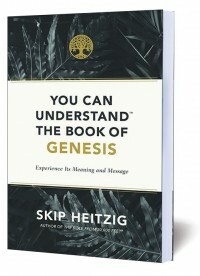 #2347 Understanding the book of Genesis is crucial to understanding the rest of the Bible. And it all starts in the beginning.